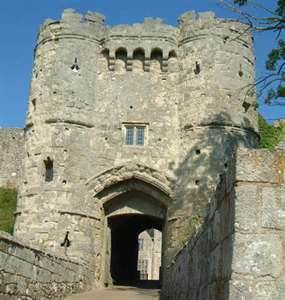 Carisbrooke Castle is an extensive fortress situated on a hill about a mile southwest of Newport, virtually in the center of the Isle of Wight. As a fortification, it has a very long history, because the Norman castle is raised on the site of a Roman fort and is surrounded in turn by Elizabethan defenses designed to withstand artillery. The Elizabethan rampart surrounds the two baileys of the Norman castle in concentric fashion. This low, artillery-proof earthwork is encased in stone. There are arrowhead bastions at the corners and a fifth one on the west, commanding the entrance. Beyond the simple gateway through the rampart, one is confronted with the main gatehouse. It began as a thirteenth century gate tower but in 1336, at the start of the Hundred Years War, Edward III extended it outwards. Round turrets flank the handsome façade and there is a row of machicolations above the entrance. The long gate passage, with three portcullis grooves, leads into a western bailey, which occupies the site of the Roman fort. Instead of utilizing the Roman wall, the Normans raised a massive rampart over it and piled up a lofty motte in one corner. Nevertheless, the Roman masonry still peeks out from the bank in several places. Before long, a polygonal shell keep was placed on the motte and a new wall was built on top of the bailey rampart. The rampart is so powerful that the curtain only needs to be of modest height. During the Elizabethan modifications, artillery bastions were added at the south corners of the curtains, but encased within both are square, open-backed towers. Clearly, they are early examples of mural towers and they are too small and too widely spaced to be effective as flankers. 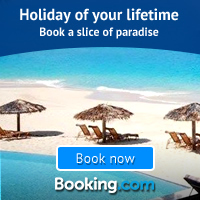 They support the written evidence that the curtain was built by Baldwin de Redvers.